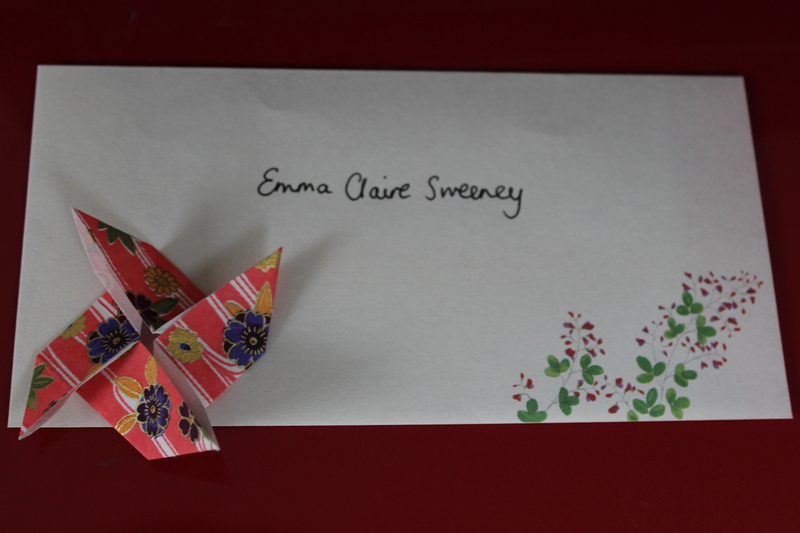 When the letter from Emma Claire arrived last week, I brewed myself a pot of tea and sat down in an armchair to read it again. I’d already sneaked a look at its contents on-line, when Emma Claire posted images of its eight pages here, but a postal delivery of this kind is such a rarity these days that I wanted to make more of an occasion of it, away from my computer screen. What struck me as I sat there, the paper bending and rustling between my fingers, was how rewarding it can be to give your full attention to a letter. Time seems to slow as you focus only on your friend’s voice in your head. It’s a different sort of experience from opening an email on a busy day, when you find yourself painfully aware, even as you read, of the dozens of other messages building up in your inbox. Not all of these things made it into my reply. Influenced by the issues Emma Claire raised in her own letter, I found that I wanted to discuss some of them in more detail instead. I ended up talking about the many ways in which I value her friendship, about memory itself, the similarities and differences in how each of our minds had preserved important recollections, and how I hoped we would correspond like this again. 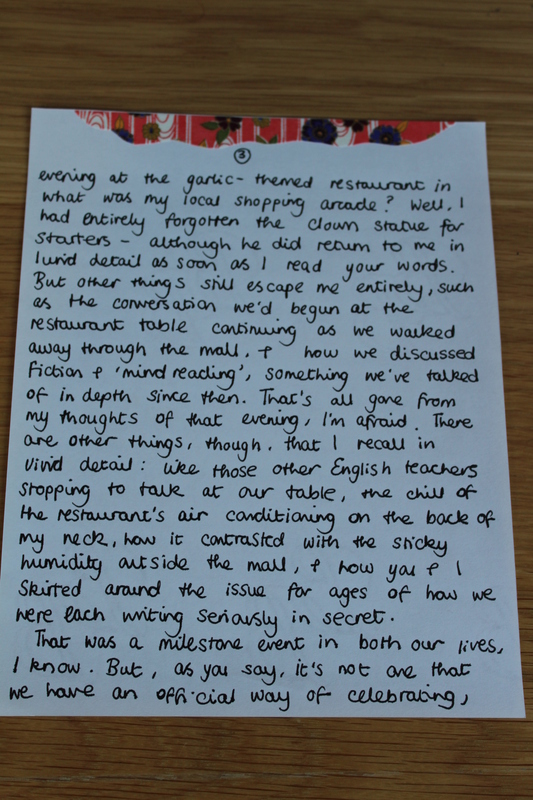 I also told Emma Claire about an earlier letter she once wrote to me, which I read again a few days ago, and the images of the past it immediately brought back. From one of the leftover scraps, I made a simple miniature windmill and added it to the envelope. If you are interested in having a go at this origami yourself, instructions can be found here. As Emma Claire did in her last post, I’ve included pictures of the pages I wrote, which you can click and zoom in on below. We’d love for you to join us in this activity by writing a letter of your own to a friend. Please use the ‘Leave a Reply’ facility below to let us know about the kinds of things you wrote in your letters. Click here to find out about this month’s challenge in more detail. It was lovely to wake up to real mail in my postbox, Emily. I re-read it this morning, yours words bringing back so many memories, reminding me of just how terrifying it felt back then to admit that we were writing. I suppose by being honest about our ambitions, we were also acknowledging that we might fail. And, of course, we both did, over and over again – as all writers must. When I imagined us both as children concocting foul perfumes in our back gardens – you in York and me in Birkenhead – I found myself wishing that I had known you then. But perhaps we were fortunate to meet when we did, just when we needed an ally. And what an ally you have been, on all sorts of fronts. It really moved me to learn that my company and conversation provided a little consolation during the saddest of times. 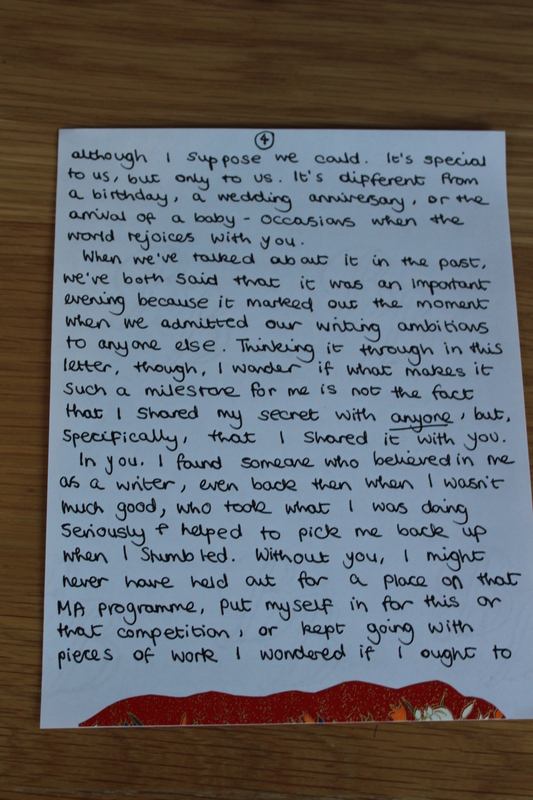 This was something I didn’t feel sure of – one of those things that we can, perhaps, best express in a letter. 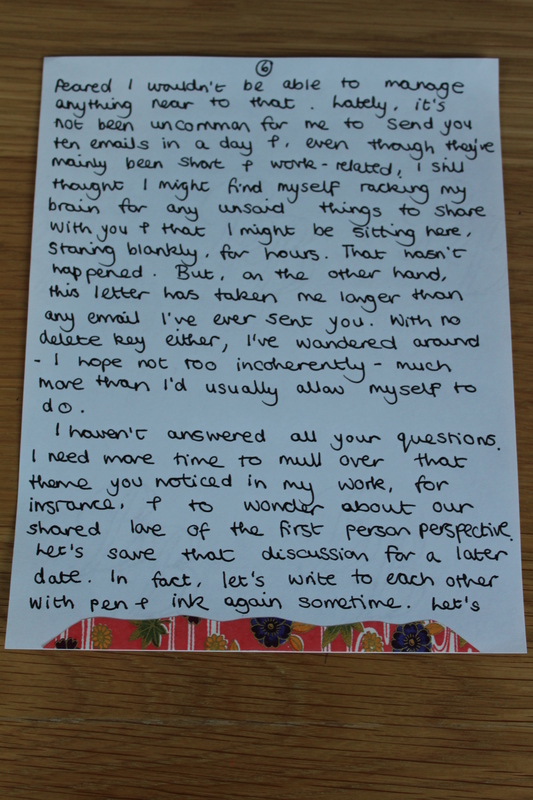 So, yes, let’s do as you suggest and write to each other again before the year is out. I’m really glad to hear that you enjoyed my letter, Emma Claire, and I look forward to corresponding again with pen and ink before the year is out. To anyone else who has taken up this month’s challenge, don’t forget that you can leave a reply here in the comment section to let us know what you wrote about. We’ve already heard from Elaine in a response to Emma Claire’s post of last week, and we’d love to hear from a few more of you. Eighteen months ago I moved from London to Manchester. I miss all my friends there, but particularly Tessa, who’s been a close friend since University and is a very special and wise person. We studied English together, I went into writing and Tessa acted for many years, before turning to screen writing, so our writing ‘connection’ is relatively new. Something Rhymed offered a great impetus to start writing to each other (which I hope will continue long after January!). I decided to write about the business of writing. How great to sit down and try to articulate my current struggles, particularly being recently published for the first time, uncertain of myself and my position in this new world of ‘published writer’ . The balance between drive and contentment is a difficult one for me, so it was great to have Tessa’s wisdom: “Your competitive streak is like a motor. Don’t be ashamed of it,” and later “You’ll have to learn to put your blinkers on and write more for you.” Something I am practicing! 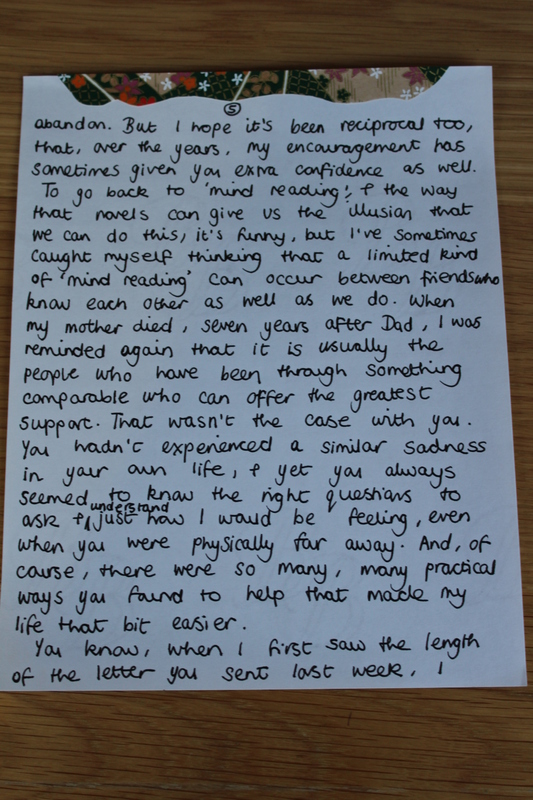 Thanks for posting this picture of your letter on Twitter, Sarah. We’re delighted that you and Tessa are joining us on our year of friendship. 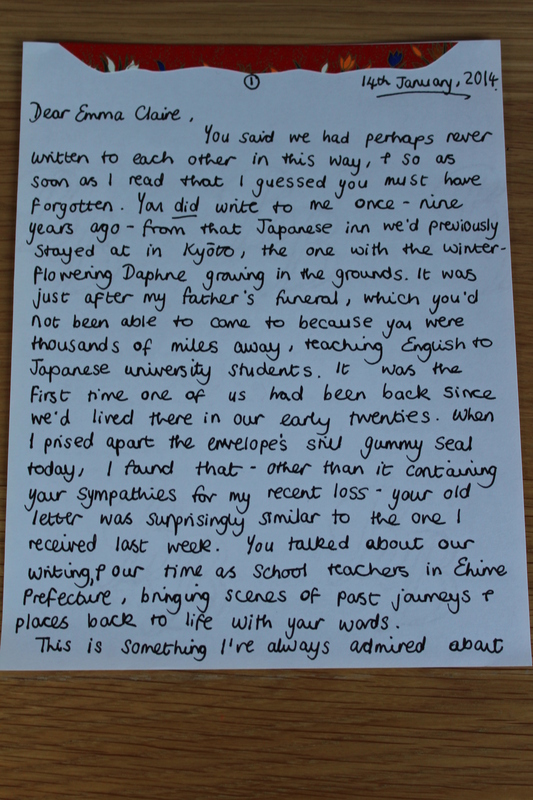 It was fascinating to hear about the contents of your letter. You’ll no doubt find Wednesday’s blog post interesting because it will focus on the role of competition between literary friends. I’m curious about the layers of reader-awareness in all of this – is it okay to ask? 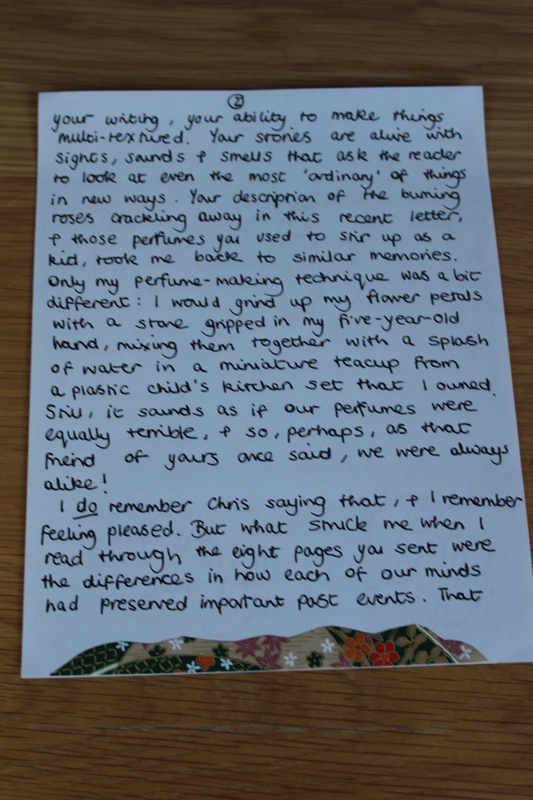 When we write a letter to a friend, we have that friend in mind, that’s who we bend our mind towards. I often wonder how aware writers like, say, Virginia Woolf & Katherine Mansfield would have been of future readers of their private correspondence. Considering Woolf’s ‘Angel’, would that have shaped her sentences? 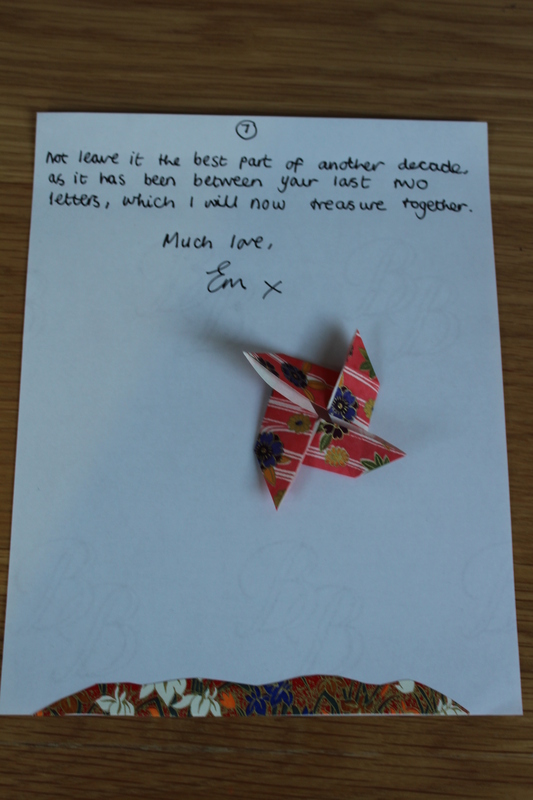 And when you (Emma & Emily) were writing these letters, did their online future colour what you said? This is something we’ve been thinking about a great deal ourselves. We couldn’t help but feel aware when we wrote our letters that they would end up online as well as in the hands of our trusted friend. This did lead to a certain amount of self-censoring, especially in relation to references to other people. Although we tried to write with as much intimacy as we would do otherwise, there were inevitably things we would feel happy to share with each other but not with the rest of the world. And we were much more careful about handwriting and grammar than we might have been otherwise! I suspect this played itself out rather differently in the correspondence between Mansfield and Woolf. Mansfield left instructions to her husband to destroy all her letters (which he disregarded), but I’m not sure at what point she would have made this decision. Woolf was obviously a great self-memorialiser so it’s possible she was aware of future readers – even though the letter we referred to in our post was written relatively early in her career. Her grammar and spelling are often pretty shoddy though! I need to think a bit more about how Woolf’s rejection of ‘the Angel in the house’ might have shaped her sentences but my gut feeling is that it made her even more determined to be candid. My little sister moved to the south of Spain in 2011 – very nice for her, of course, but I obviously speak to and hear from her a lot less than when we were both living here in England. We’ve tried different ways of keeping in touch… I’m not on Facebook and I’ve never really enjoyed talking much on the phone. Skype with its glitches and delays doesn’t do it for me. For a while we got into ‘meeting’ for an instant messaging chat, which was much more fun. But for the last year or so we’ve reverted to traditional letter-writing, for all the reasons you’ve talked about on this site. It’s so much nicer to receive a properly composed letter – where you know the author has sat down and given it some proper thought beforehand – than a quickly dashed-off email that quickly gets lost in the midst of my overloaded inbox. And of course it’s great to receive something in the post that you didn’t order yourself and isn’t a demand for money or a leaflet for a new takeaway pizza joint. Rather than going down the fancy letter-paper route, however – which does look awesome by the way – what we’ve been doing is writing our letters in Word and then saving them on to a memory stick, and then physically posting the memory stick to one another in the mail. What’s nice about that is you can fill rest of the memory stick up with photos you’ve been taking, music you’ve been listening to, even films you’ve been watching, for the other person to enjoy. But obviously it’s still a very small parcel, so not expensive to post internationally. And it means when you get in from work you find there’s some interesting in the mailbox waiting for you with the bills – and when you open it up there’s a letter and photos and other stuff all there inside. Anyway I thought you might be interested as it’s a slightly different twist on the theme. And thanks, by the way – your blog has inspired me to get off my backside (well, okay, sit down on the sofa) and write to my sister this afternoon.